IT IS a case of deadly food poisoning. Caused by a new strain of Escherichia coli bacterium, the outbreak has sickened over 2,000 people in the EU in the past month. At least 25 succumbed to the disease in Germany, the epicentre of the outbreak; more than 600 were hospitalised with kidney complications. A handful of cases have also been reported in the US and other European countries, including the UK, France, The Netherlands, Spain and Switzerland. 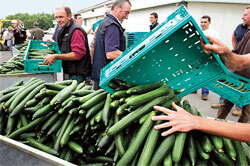 All affected people had travelled to Germany shortly before falling ill.
German health authorities who reported the outbreak on May 2, initially pinned its origin on cucumbers from Spain. It, and several other EU countries, alerted people against eating raw vegetables. Later it turned out that the strain in Spanish cucumbers was different from the one causing the outbreak. The focus shifted to Germany following reports that 17 people had fallen ill after eating bean sprouts at a restaurant that receives supplies from a farm in Lower Saxony state. They were infected with the same E coli strain causing the outbreak. The authorities closed the farm and recalled its products. The agriculture ministry on June 4 said all indications show the bean sprouts are to be blamed but tests are yet to confirm it. Back home, the Food Safety and Standards Authority of India (FSSAI) has alerted its ports and airports. It says all fruits and vegetables from Europe will first be tested in FSSAI labs before being allowed into the country. E coli is part of bacterial flora in the gut. While most strains are harmless, some cause infection. The strain that caused the outbreak is one such highly virulent, mutated strain. Identified as Shiga toxin-producing E coli, the strain is an enterohaemorrhagic E coli 0104:H4, which causes blood diarrhoea and can lead to serious kidney complications. WHO recently said it “is a unique strain that has never been isolated from patients before” and there may be “various characteristics that make it more virulent and toxin-producing”. Genetic decoding by Germany’s Robert Koch Institute shows the strain is resistant to eight classes of antibiotics and their combinations. E coli is usually not resistant to antibiotics. As per the UK Health Protection Agency, it produces certain enzymes which make it resistant to widely used antibiotics such as cephalosporins. The strain has two deadly genes—TEM-1 and CTX-M-15—that can cause organ failure in humans, resulting in death. Rumours are that this superbug has been developed in lab. For the strain to acquire resistance to eight classes of antibiotics, it must be repeatedly exposed to them, writes Mike Adams in his journal NaturalNews.com, which tracks issues related to health, environment and consumer affairs. This might have been done to discourage raw fruits and vegetables and flood the global market with processed foods. “All this is happening on the heels of the EU ban on medicinal herbs and nutritional supplements,” he says, adding that the strain can be treated with a combination of natural antibiotics like garlic, ginger, onions and other medicinal herbs. Leaked WikiLeaks cables show Spain resisted the introduction of genetically modified organisms (GMO) into the country, even as the US covertly threatened political retaliation. Adams writes that the false blaming of Spain is perhaps in retaliation for its unwillingness to jump on the GMO bandwagon. When the outbreak was reported, apart from Spanish vegetables, Dutch supplies were also named as possible sources. As Germany and other EU countries stayed away from fresh vegetables, trade in these countries was affected. Spain, which relies heavily on farm exports, claims its farmers incurred losses of €200 million a week and has demanded compensation. The government has sought “accountability from those who blamed Spain” for the outbreak. The Dutch lost a third of their market. To make matters worse, Russia and Portugal recently announced a ban on all vegetables from the bloc. Calling Russia’s embargo unjustified, the EU warned it would hinder its admission into the World Trade Organization.